Off-road ATV use is prohibited within this park. The Cascade Mountain Range surrounds the park and includes awesome canyons and clear flowing streams. Large numbers of otter, beaver and red squirrel inhabit the area, as well as, mountain goats, cougars and grizzly bears. Fishermen will find time spent on Otter Lake rewarding, with large lake trout being the catch of the day. If you travel off the beaten path in this park, let someone know where you are going and carry a compass. Areas bordering the park include canyons and beautiful, rugged terrain which can be confusing. The extremely hot, dry Okanagan climate can result in overexposure to the sun. Sunscreen and a hat should be used during long periods in the sun. Currents can be deceptively fast in streams. Cross them with caution and be sure of your footing at all times. Accessing the park using secondary forestry roads from B.C.’s lower mainland, as suggested by Google, is not recommended; these routes are unreliable and are not safe. The park is located 33 km northwest of Princeton off Hwy 5A toward Coalmont and Tulameen and the route is well marked with signs. There is also access from Hwy 97C, Coquihalla Connector Hwy – turn at Aspen Grove, which is Hwy 5A, and follow signs. A 34 km gravel road leaves Hwy 5A just past the Kentucky-Alleyne turnoff. It leads through sections of the Nicola Ranch to approach Otter Lake from the north. The roads, both from Tulameen and the gravel road from the north, are narrow and winding with limited visibility. Use caution and yield to logging trucks. History: Tulameen, just 5 km south of the campground, is an area steeped in mining history and pioneer legend. It was formerly used by First Nations as a base camp for hunting and trapping. The fur trade attracted the Hudson’s Bay Company to the area and their fur brigades used a route which passed through the town. They named it “Encampment des Femmes” after the women who waited for their men out trapping or on the brigades. (Also known as Otter Flat in later years this spot was officially named Tulameen in 1901 – an indigenous name referring to deposits of “red earth” (ochre) found in this area). Gold brought people to the region in the late 1890s and Granite Creek became the third largest city in B.C. rivalling Vancouver and Victoria. Communities sprung up on the strength of the coal and copper mining industry and attracted the Kettle Valley Railway (KVR) and the Granby Mining Company. The region became Canada’s sole supplier of platinum and its coal powered the KVR and the VV&E, part of the Great Northern Railway. Today, crumbling building foundations and the empty rail-bed of the KVR winding towards the horizon are echoes of a prosperous past. Canoeing and kayaking allowed on Otter Lake. The narrow lake is ideal for non-motorized watercraft with plenty of shoreline to explore opposite the campground. Otter Lake is stocked by the Summerland Trout Hatchery with rainbow trout fry resulting in excellent sport fishing opportunities. Anyone fishing or angling in British Columbia must have an appropriate licence. Ice fishing is possible on Otter Lake. There is a nature trail along the lake. If you travel off the beaten path in this park, let someone know where you are going and carry a compass. Areas bordering the park include canyons and beautiful, rugged terrain which can be confusing. For your own safety and the preservation of the park, obey posted signs and keep to designated trails. Shortcutting trails destroys plant life and soil structure. Across the lake, and visible from the campground and day-use area, is the Trans Canada Trail. The Trans Canada Trail will be a shared-use recreation trail that will wind its way through every Province and Territory forming the longest trail of its kind in the world, spanning approximately 17, 898 kilometres. It will accommodate five core activities: walking, cycling, horseback riding, cross-country skiing and snowmobiling (where possible/desired). It follows the Kettle Valley Railway line past Otter Lake on its way from Princeton to Merritt. There are no lifeguards on duty at provincial parks. A small beach at the campground boat launch provides a spot to swim though it is better at the day-use area in Tulameen. Waterskiing is allowed on Otter Lake. The campground has a concrete, single lane boat launch without a dock. Caution: in August, when water is low, the campsite boat launch drops off at the end of the launch about 5” to 6”. There is a small gravel turn-around area above the boat launch which is accessed from the 17 spot gravel parking lot via a short, single lane gravel road. Two pit toilets are in the trees beside the parking lot along with two horseshoe pits. A narrow strip of coarse sand extends from the boat launch towards the western shore of the lake. There is also a public gravel boat launch in Tulameen. There are four cold water taps located throughout the park. Taps are shut off during the off-season. Otter Lake has a day-use/picnic area approximately 5 km south of the campground in Tulameen at the end of Sixth Street. It is a popular spot with residents. There is parking for roughly 20 vehicles. Six tables are located around the edge of an open, grassy area. Shrubs and aspen provide shade around the tables. There are two pit toilets (neither wheelchair accessible) and a handpump for well water. 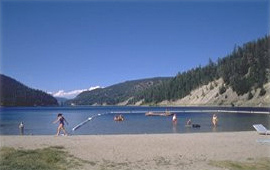 A beach of fine sand forms a strip around the end of the lake which is great for swimming. Though there are no buoys, an anchored wooden float sits off shore. The water is clear and the bottom sandy with a few pebbles. There are four pit toilets and four flush toilets located in the campground. This park offers vehicle accessible campsites, including 5 double sites and 5 pull-through sites. The pull-through sites have slightly curved parking and may not accommodate motorhomes over 30 feet. The gate to the park is closed during the off-season. While there is no gatehouse, an information shelter, telephone and handpump water source are located at the entrance to the park. The small sites are spread out in a dense forest of Douglas fir trees that provides privacy, shade and a natural setting. Large, mature Douglas fir and Ponderosa pine are found in small numbers. Though the abundance of trees adds to the ambience of the campground, they may also make the entrances to some of the sites a little narrow for some larger RVs. The sites are gravel and have a fire ring and picnic table on a cement pad. There are no BBQ attachments. The park offers services during the peak season. During this time, all of the sites in Otter Lake Campground are reservable and non-occupied reservation sites can accommodate first-come, first-served customers for one, or perhaps more nights, depending on availability.